Selling books throughthe online is an emerging trend although makes profitable business thorough renting books or selling respectively. You can find a number of vendors who offer EBook selling android application but you can find unique features from Php Scripts Mall for a long-term standard business. Through Android Studio we have followed web trends to motivate the user experience throughout the bookstore platform. Being a user-friendly structure, the user can navigate into the application with no trouble. People have migrated to learn books, stories through mobile application rather finding bookstore shops. To support the advanced internet era, our marketplace bookstore application supports multipurpose business model like physical media, eBooks reading and audio books etc. Registered user can filter the desired results search by city or category, by top books. The user can read books, stories by book name, image, the price for rental purchase, author name, full description about the book and the author, etc. The user can view the ratings and reviews about this by clicking the icon which is present in the top right corner of the page as well as write reviews on purchased items.In the review, section the user can view the updated review of particular books. Whereas in the appointment section user can see the order details with book name, order type, order date and status of the order, at any case one can also cancel the order if not interested. Through the admin panel, the user can post the lists of book and categories are managed by the admin. Admin can have a comprehensive feature to control the bookstore platform. Site settings like CMS, categories, location, user management, bookstore management, banner advertisement, managing orders, review management,and search filter etc. Admin dashboard is clear to understand even if you are not aware of coding language.In eBook selling android app, bookstore management accessbook title, author name, category, and language, published year, published by, edition, price, rental price, book description and more. All our website script and Android application areSEO optimized to fetch and rank well in major search engines. Being a responsive design which suits all mobile devices. We have added many revenue models to run the monetary business without much effort. 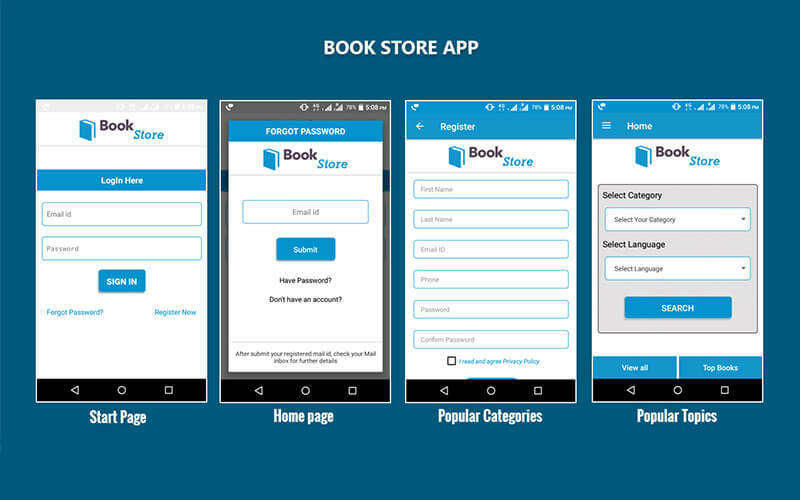 Online bookstore app is design and built with Android platform, MySQL, PHP, XML, JAVA. Based on your requirements you can purchase a singledomain, multi-domain or multi-domain license with reseller and this is the onetime payment, upon purchasing our products we will send entire source code to you. An excellent android from the intelligent coders, Book Store Android Application is best in class. Worth to buy and start your online business. Rated 5 starts for very mobile responsive and can easily navigate to the booking functionalities. Business associates approach to discuss on my custom app solution was awesome and got my points absolutely. Good experience with you guys.